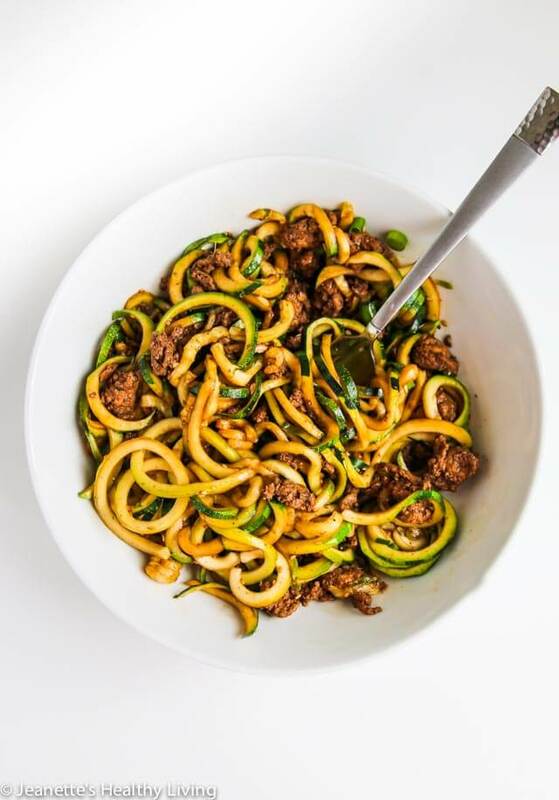 Chinese Five Spice Ground Turkey Zucchini Noodles are a great low carb option for a delicious dinner. There’s a local restaurant that has a few zucchini noodle options on their summer menu. One was served with ground turkey and tomato sauce. It was light with just a little bit of tomato, and surprisingly, served room temperature, almost cool. I had expected either a cold zucchini salad with turkey breast pieces, or a hot version. So, when my zucchini noodles arrived with a light ground turkey sauce served at room temperature, I was surprised. It actually tasted really nice. 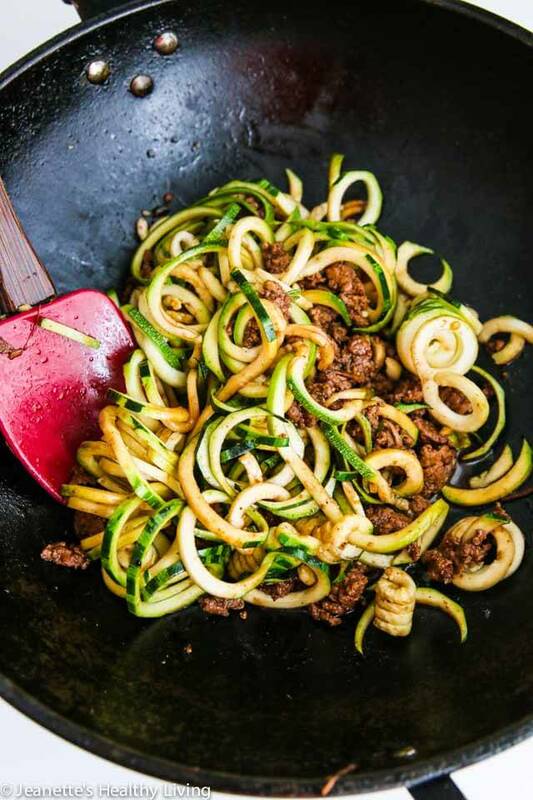 Chinese Five Spice Ground Turkey Zucchini Noodles is my version of a favorite dish my dad makes called Za Jiang Mian. 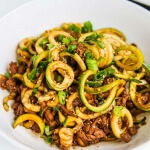 Za Jiang Mian is typically made with Chinese bean sauce and hoisin sauce, but I used soy sauce and five spice powder in this recipe to mimic the flavors. 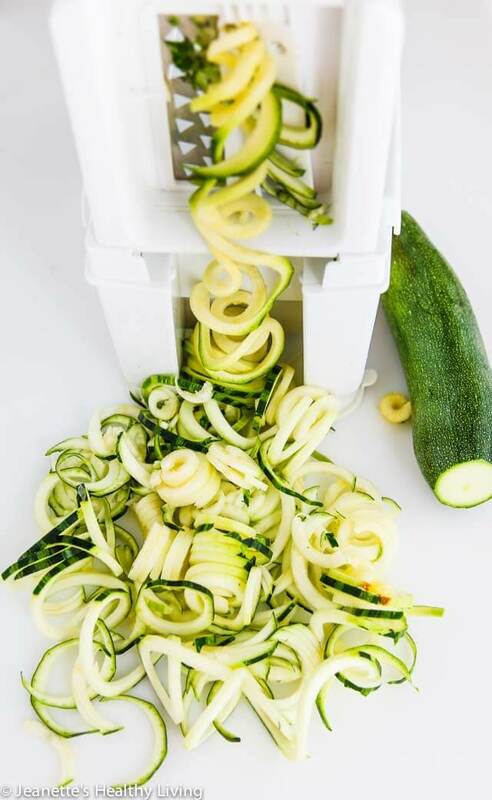 I finally broke down and bought a spiralizer earlier this Spring and have been using it mostly to make zucchini noodles for my husband and me. We’ve been trying to cut back on pasta so zucchini noodles have been an easy way to enjoy meals with the kids when they’re having pasta. My spiralizer is made by Paderno and has four blades. It’s fairly sturdy and comes apart pretty easily. I usually drop the zucchini noodles into a pot of boiling water and cook them for a few minutes to slightly cook them, but they often come out really watery. So, this time, I just tossed the zucchini noodles into the sauce and tossed them around until they were slightly cooked. They kept their shape much better and weren’t watery at all. 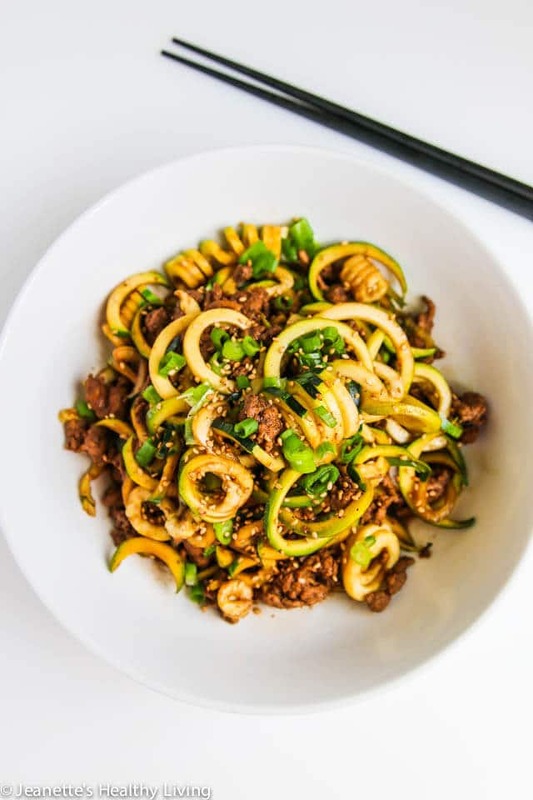 Give these Chinese Five Spice Ground Turkey Zucchini Noodles a try and let me know what you think. 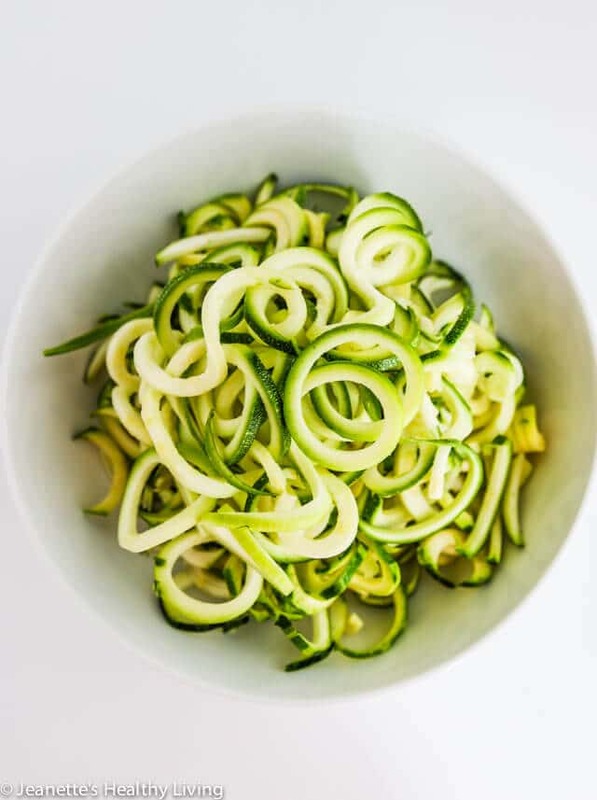 If you have a spiralizer, you can make your own zucchini noodles. 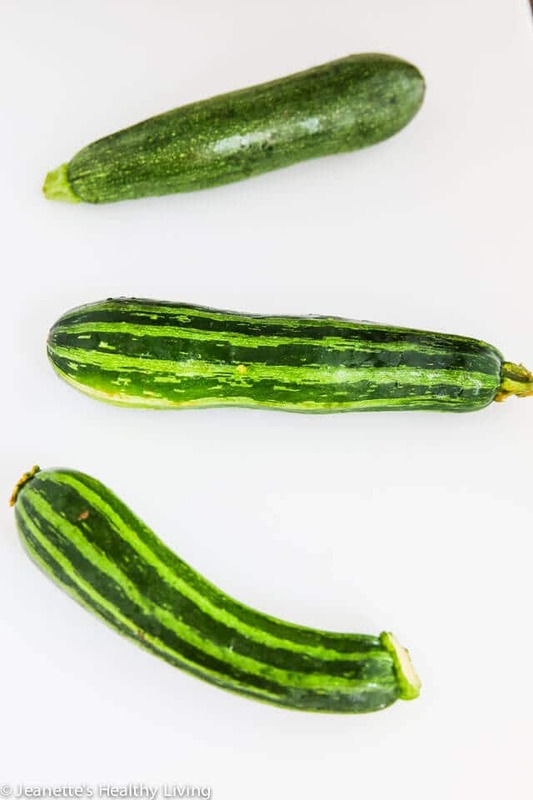 You can also find zucchini noodles at some supermarkets in the produce section. Heat oil in a large pan or wok. If desired, add ginger, garlic, and/or red pepper chili flakes. Saute turkey until brown; drain any liquid off. Add soy sauce, sugar, five-spice powder, sesame oil and water. Toss to coat meat well and cook for a few minutes. Season to taste with salt and pepper. Add zucchini noodles and toss to coat; cook for several minutes until done to your preference. I like my zucchini noodles just barely cooked; otherwise they get soggy. If you let the hot zucchini noodles and sauce sit for a few minutes, the noodles will soften a little more. This is delicious eaten room temperature too. If you like spicy food, serve with Chinese hot bean sauce or add some red pepper flakes during the cooking process. Low carb, low calorie, but loaded with flavour and goodness. I love it! Thank you Serena! 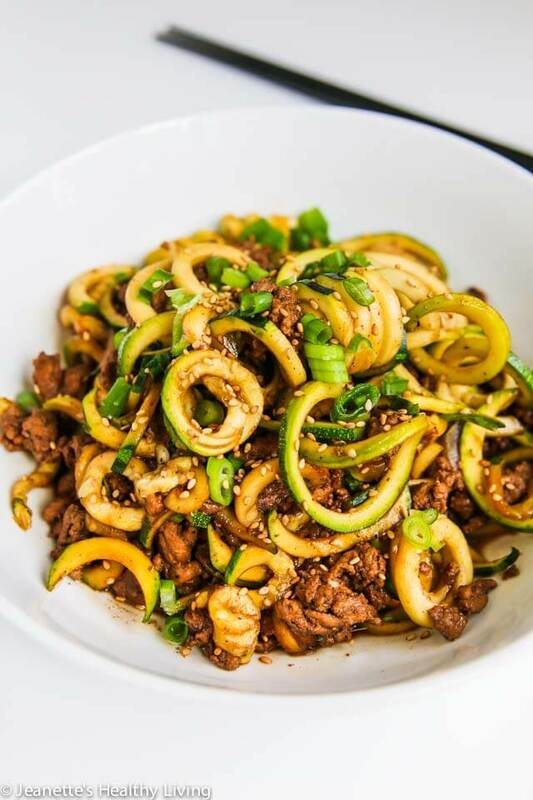 It’s awesome that restaurants are starting to offer zucchini noodles – great low carb option. Hope you and your family enjoy this! So glad this recipe sounds like it will fit with the low FODMAP diet you’re on. I hope you enjoy this! How did you know I was craving Chinese food?!! Yum! I love how easy this recipe is too-can’t wait to make it! Thanks EA – I hope you have a chance to try these zoodles! Wow Jeanette, this dish looks amazing! The flavor on these zoodles looks awesomely intense!! Thanks Sonali – this zoodles definitely have some deep flavors to them! Making this for dinner this week!! So excited to try it! The flavor seemed a bit mild (or more mild than I was expecting). Not sure where I went wrong. Soy sauces have different depths of flavor and amounts of sodium depending on the brand. If you like stronger flavors, you can add a little more five spice powder. I like to eat mine with Chinese hot bean sauce for spiciness. Can you use something else instead of grape seed oil? Coconut oil? Are these whole 30 approved? You could use coconut oil or extra virgin olive oil. I found this recipe to be bland, I added extra five spice and also added minced garlic & onion as I browned the ground turkey 😛Definitely enhanced the flavor. Maria – garlic, ginger and/or onion would definitely be nice additions – even some hot red pepper flakes or chili sauce. I just made this and it was delicious! THanks Jeanette! 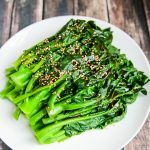 Who doesn’t love a 1step, 5 minute healthy meal?? 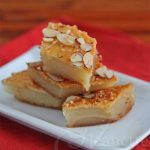 Donna – so glad you enjoyed this recipe! Thanks so much for letting me know :). Just discovered this recipe. 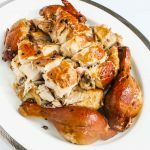 Do you drain the turkey before adding the soy sauce, etc.? Hi Misty, yes, I would drain the turkey juices off before adding the other ingredients. Made this tonight and I loved it !! Made as is and it was perfect !! Thank you, this will become a go-to recipe ! 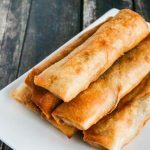 Hi Diane – so glad you enjoyed this recipe – thanks so much for letting me know! Delicious!! Made this for lunch today & it was so full of flavor. 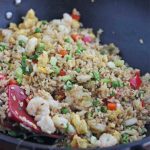 I used siracha oil instead of grapeseed & added red pepper flakes to kick up the heat. Will be making this again!! Thanks! 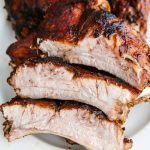 Thanks Lacy – so glad you enjoyed this recipe! I love the substitution of siracha oil and red pepper flakes for some spiciness. I usually serve it with hot chili bean paste on the side, but I’ll have to try your modification next time! I don’t have any Chinese five spice blend in my pantry. What would you recommend as a simple sub? Chinese five spice blend contains cinnamon, star anise, fennel, szechuan peppercorns and cloves, so you can either leave it out of the recipe completely, or add a few shakes of ground cinnamon, ground fennel, and black pepper (whole szechuan peppercorns can be found in Asian grocery stores, but if you don’t have them, more black pepper will add a little extra heat). If you have star anise, you can grind and add a little. I feel bad commenting with a negative review but I don’t want people to end up wasting ground turkey like I did! 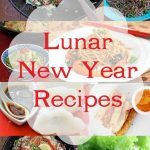 I’d been wanting to make this recipe for a while and finally committed to finding Chinese 5 Spice powder in the store. I should have looked at what the actual spices are, for those who don’t know, one of the main ingredients is cinnamon. 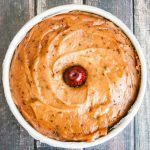 Cinnamon and ground turkey just do not go together! My husband, who usually eats everything, couldn’t get past the cinnamon flavor either and we ended up tossing ours. Next time I will do more research on my spices! Hi Cyndi, thanks for your honest review. 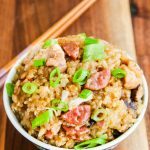 You are correct – Chinese 5 spice powder does have cinnamon, so if you aren’t used to that flavor in savory dishes, you probably won’t like anything made with Chinese 5 spice powder. Personally, I love Chinese 5 spice powder and don’t find the cinnamon too strong – more anise flavor, but it is definitely a personal taste. 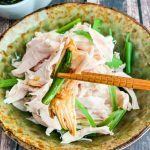 You can certainly leave it out and just use soy sauce and sesame oil to flavor the meat. Made this for dinner tonight and added jalapeños to the turkey. So so good and flavorful! The sesame oil really makes a difference and I’m excited to put add it to more recipes. Hi Claudia – so glad you enjoyed this tonight – I love your addition of jalapeños for some fresh spicy flavor!